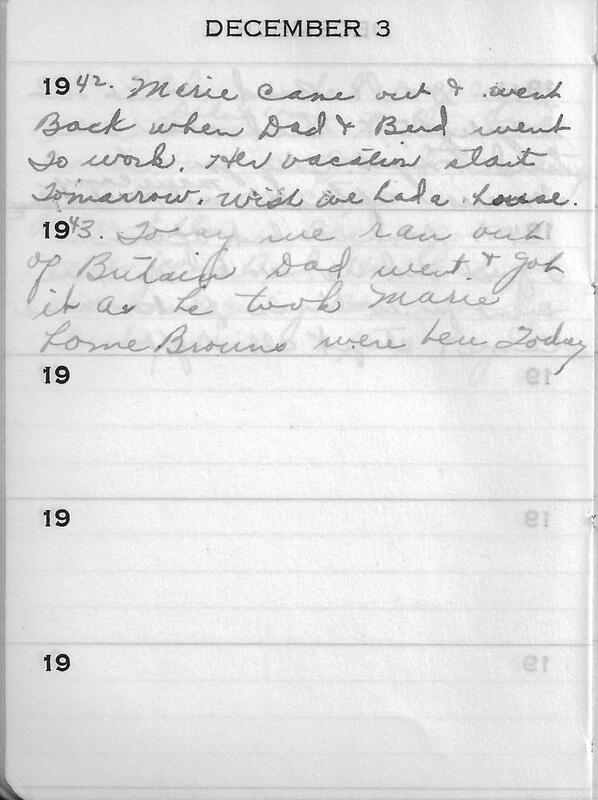 1942 – Marie came out & went Back when Dad & Bud went To work. Her vacation starts Tomorrow. Wish we had a house. Grama had a list of addresses in the front of the diary and for December 1942 she wrote down Gateway Auto Court in Santa Maria, California as their address. It looks like they’d been there since Sep 19th (moved there from Los Alamos, California) and would move on to Pismo Beach, California on December 26th. No wonder she wanted a house. She was tired of moving and tired of living in little auto courts. This entry was posted in Tennant, Wright and tagged Auto Court, California, Family history, genealogy, Los Alamos, Martha Marie Tennant, Martha Marie Wright, Martha Marie Wright Tennant, Martha Tennant, Pismo Beach, Rene Baron, Santa Maria California, Sylvia Rene Stevens. Bookmark the permalink.